Cleans drain lines from ½" up to 1½" in diameter. Lightweight polyethylene drum will not dent or rust. 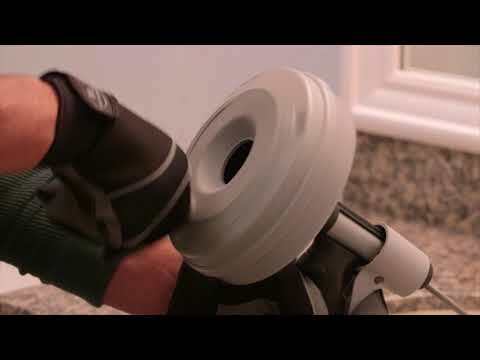 Drain Size Cleans drain lines from up ½" to 1½" in diameter. Cable 25' of 1/4" MAXCORE cable. KWIK-SPIN+ Hand Spinner with AUTOFEED® is rated 2.3 out of 5 by 11. Rated 3 out of 5 by Gregson from THe Autofeed does not do anything. I could use it as an auger by pulling and pushing the fish line, but the autofeed wheel did not do anything. I only tried to use it once; I may return it. 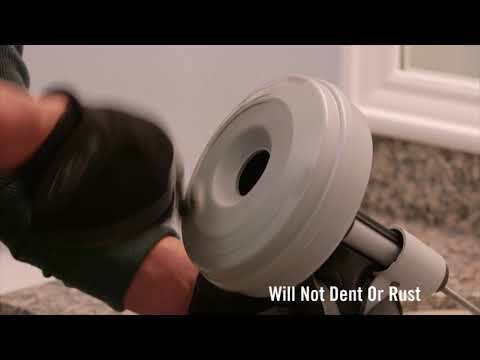 Rated 1 out of 5 by stlbob from Cable kinked 2 hours after purchase I purchased this tool versus alternatives at Home Depot because of the Ridgid name and warranty. Two hours after the purchase the cable has a permanent kink. I should have bought one of the alternatives that were available. My bad for trusting Ridgid. Rated 1 out of 5 by Diezl1415 from IN A WORD, GARBAGE!!! DO NOT PURCHASE!!! I rated this item one-star because zero was not an option! The instructions, written on the inside of the plastic wrapper, are worthless! Had to use the internet just to determine how to operate. After one unsuccessful use, the product will not retract. RIDGID should be embarrassed to put its name on such garbage! Never again will I purchase a RIDGID product! What a waste of time! Rated 2 out of 5 by RidgidRefugee from Won't rewind I was able to clear out two bathroom drains, but after the second the auger would not retract no matter how much I turned the crank. Rated 4 out of 5 by CharlesB from Works pretty Well The product works pretty well. You just have to realize that advancing and retracting the cord is a very slow process because it is using the treads on the cord which are very close together.